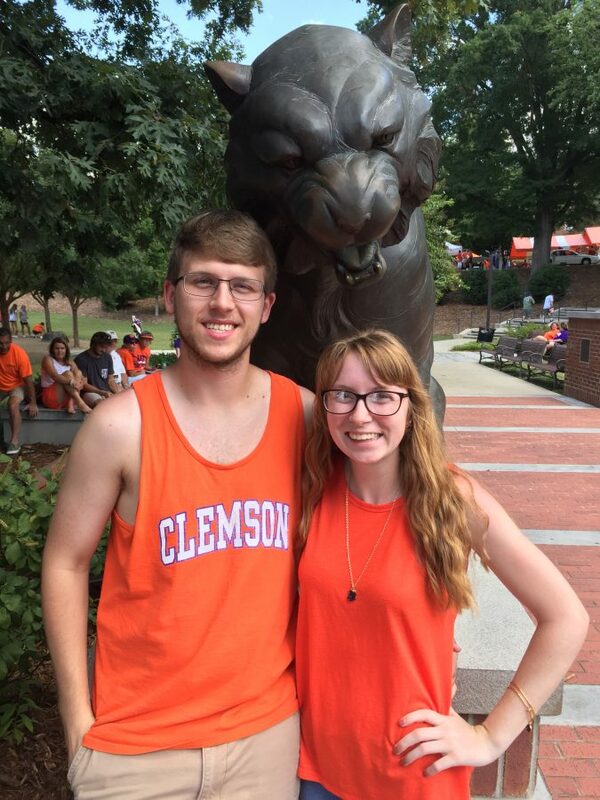 Taylor and I met in high school; he was a senior and I was a sophomore. We both were in the same French class. I always thought he was super funny and cute, and turns out he had his eye on me too. He got my number from a friend and texted me “Is this Ms. Fallon Tingler?” (trying to be sneaky, not saying it was him). He had forgotten that when we first met he had put his number in my phone as a joke, and so I knew it was him. We texted every day after that and then he took me to a mutual friend’s New Year’s Eve party. I was nervous being around him, especially thinking about getting a midnight kiss later. 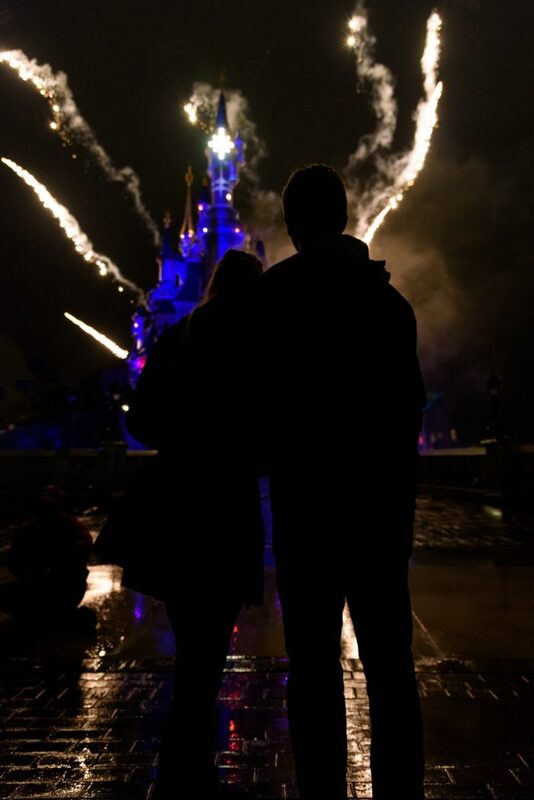 Although he didn’t kiss me at midnight (he was shooting off fireworks), when we walked to his car, he said “I should have done this earlier, but…” and gave me my first ever kiss. Three days later, he took me on a date to an Italian restaurant downtown, and asked me to be his girlfriend. 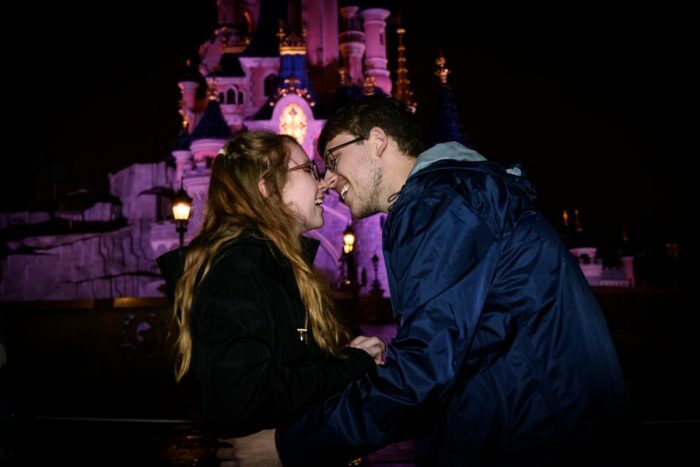 We’ve been together ever since–a little over 4 years now! 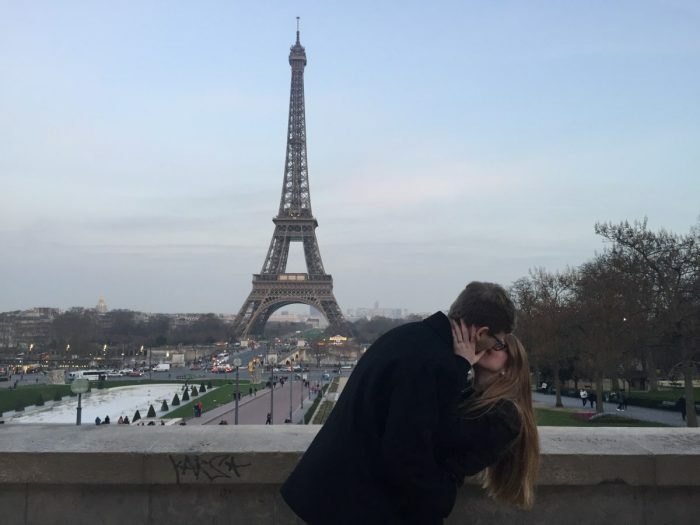 Right now, I’m studying abroad in Paris, France, and Taylor came to visit me during his spring break. 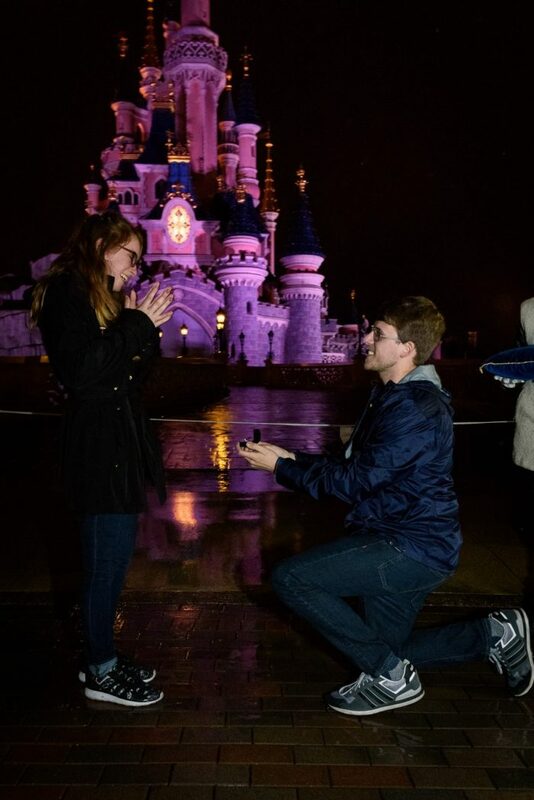 Apparently, once we had decided when he was going to visit, He started talking to the photography planners at Disney in January to set up the proposal. He made sure to ask my parents for their permission and to get advice from my best-friend. I started counting down the days in January and when the week finally came I was beyond excited. We had the most amazing week, traveling to Nice together and exploring the City of Love. 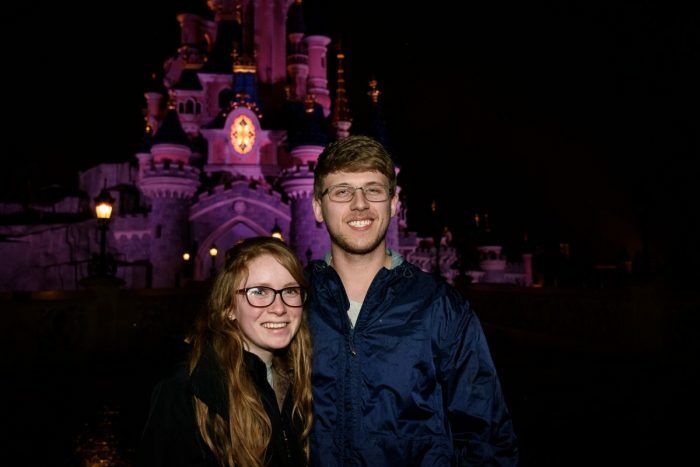 On Wednesday (March 8), we went to Disneyland Paris. 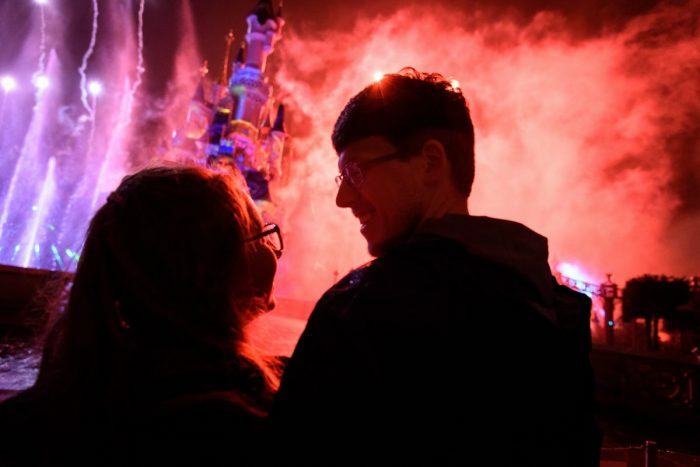 We had so much fun riding all the rides and experiencing the Disney magic. 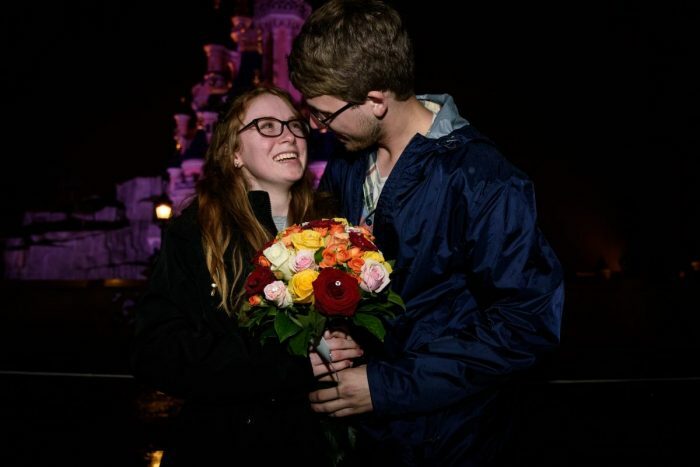 Around 5 pm, he told me that he had a surprise for me and that we had to be somewhere at 7. 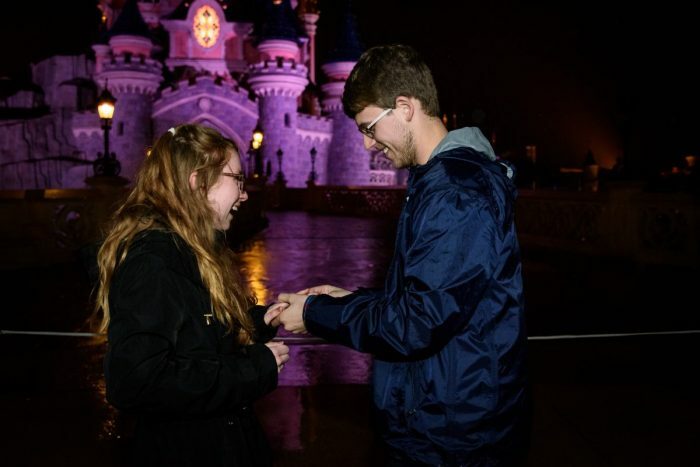 Turns out, he booked a Disney photographer for us so we could take pictures before and during the fireworks show. 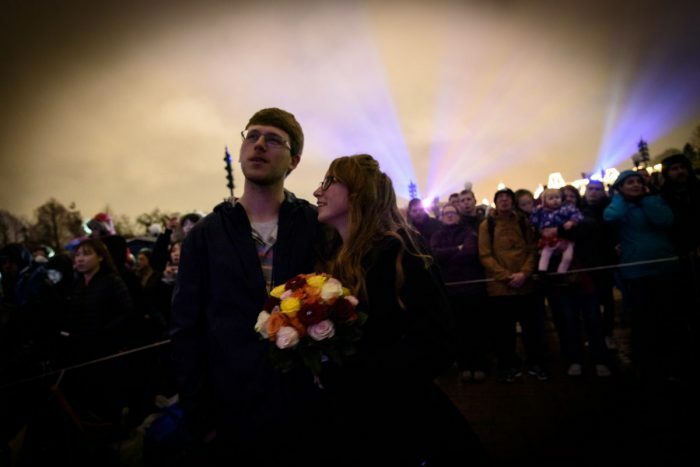 The photographer took us to the front of the line where people were waiting to watch the show, right in front of the castle. 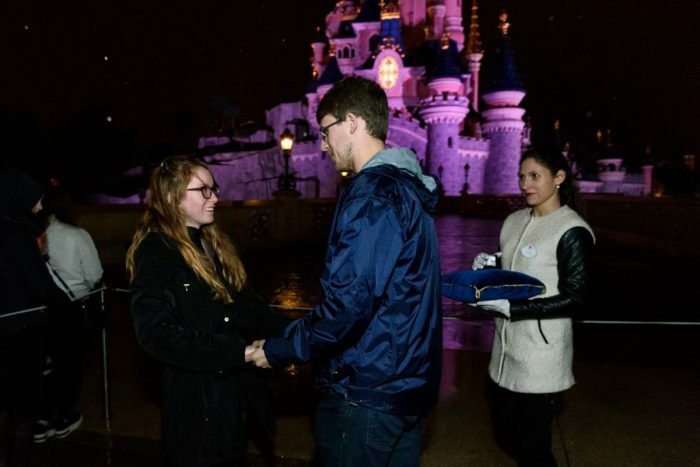 We started taking some pictures, when suddenly a cast member comes walking towards us with a ring on a pillow. 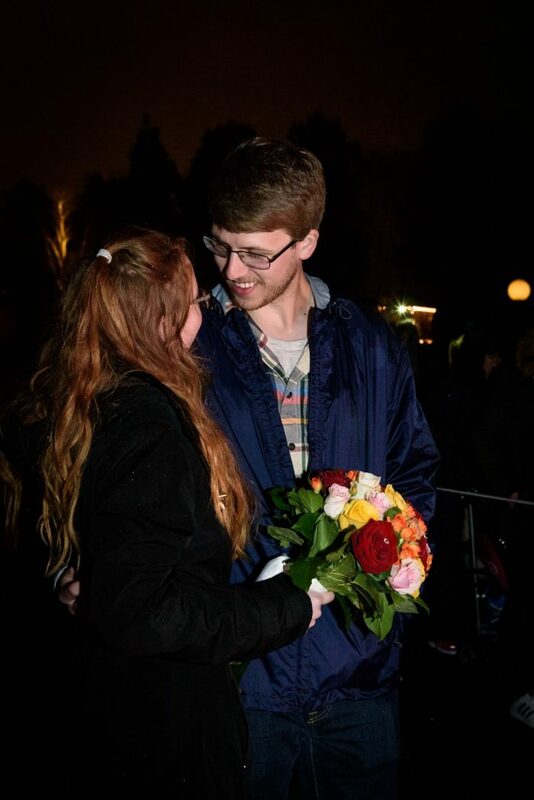 Taylor gave me a hug and told me how much he loved me, then got down on one knee and asked me to marry him. 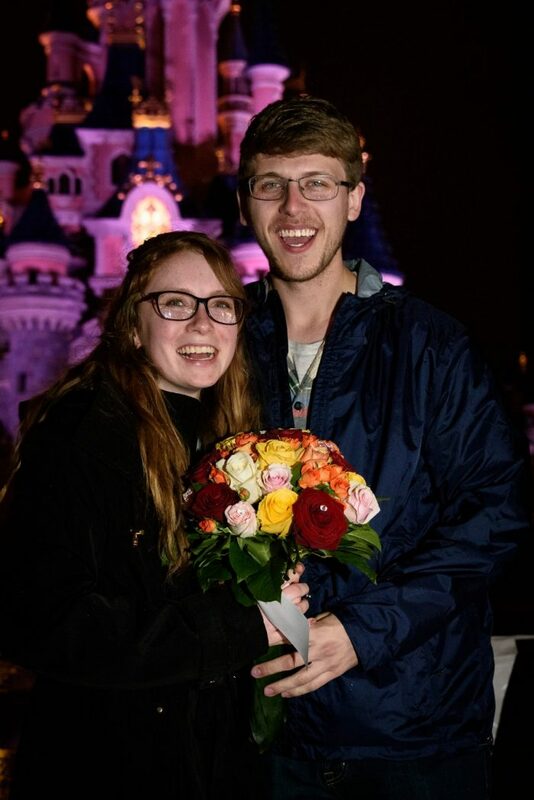 It happened so fast, but I heard the crowd around us cheering and I couldn’t stop smiling. 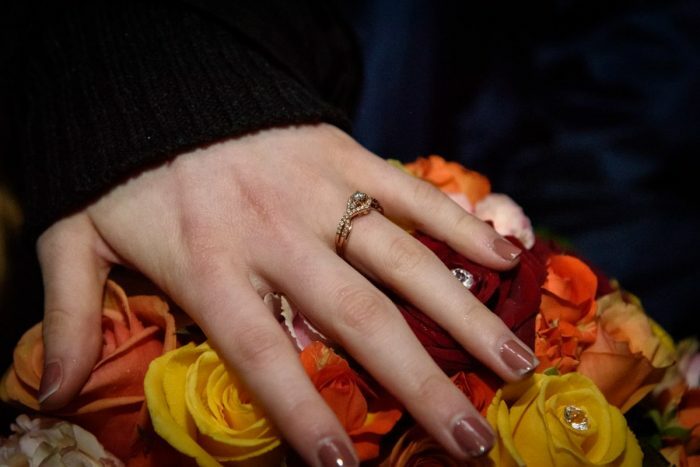 Before I knew it, I had the ring on my finger and a colorful bouquet of the most beautiful roses. 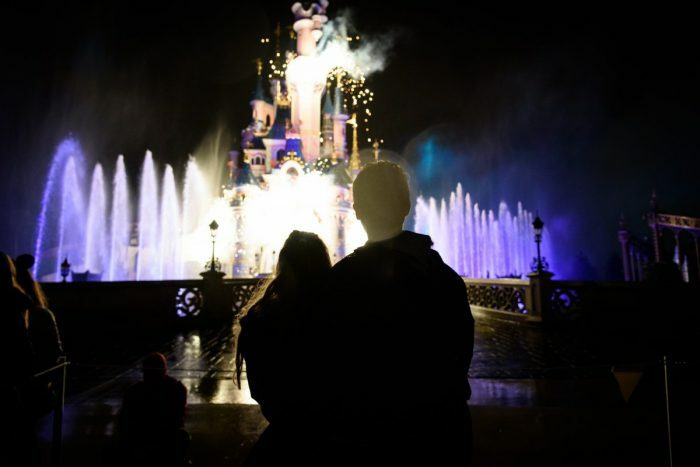 It was the perfect ending to the most magical day. 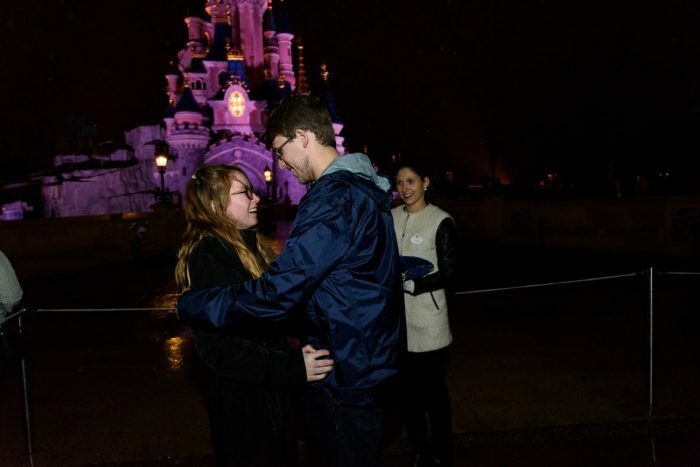 I’ve always loved Disney and Paris and I’ve always dreamed out being proposed to in Paris. 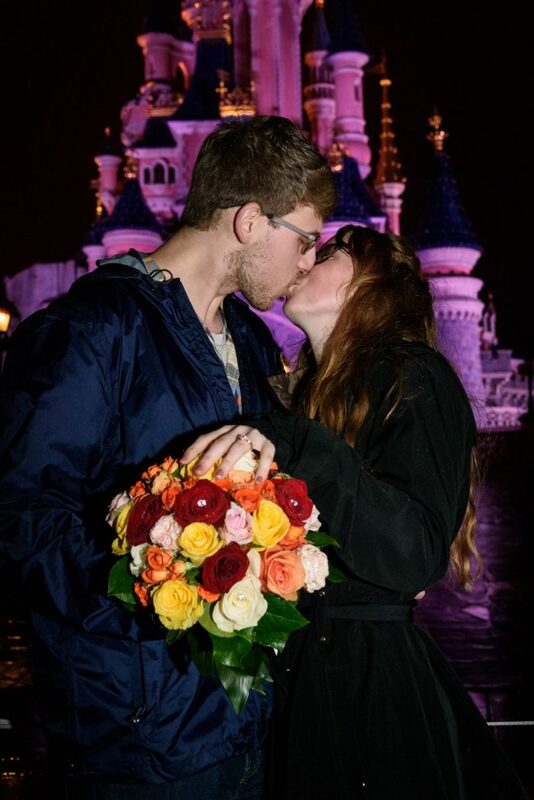 Taylor made my dreams become a reality and I’m so in love with him and the proposal.